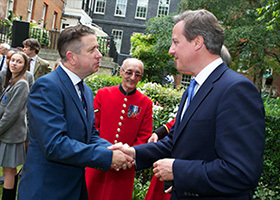 The NCFA’s Director, Ernie Brennan talks about meeting the Prime Minister and visiting 10 Downing Street to discuss the Peace Fields Project. Funded by the National Heritage Lottery Fund, the Football & Peace Pilot Project was considered a success with partners, participants and the government. The Peace Fields Project continues the good work and invites schools and sports clubs to twin there areas of play with Flanders Peace Field. PC. So how did the invite come about? EB. The Football & Peace Project profile hit the roof in terms of enquiries when Andrew Murrison, MP, featured on the NCFA website. The Government have been helpful for organisations like the NCFA seeking to commemorate WW1 at grass roots community level. NCFA’s work chimed with Helen Grant, Sports Minister, who very kindly found the time to attend the Football & Peace Day Celebration at Maidstone United Football Club’s Gallagher Stadium, last May. Over the last couple of years NCFA have been in the position to lobby the custodians for support commemorating WW1. The predictable lip service from the business world of football that followed was recognised by numerous organisations, MPs, councillors and education. A body of support who value the Football & Peace Projects and the Peace Fields Projects, wanted the community programmes to work in a way that wasn’t selling football as a product. The Christmas Truces thankfully lacked Fifa rules and Skye television. Also a number of national newspapers referenced our work – in answer to your question; the Government clearly get it, the Press clearly get it, the public clearly get it- I think that is why NCFA’s work led to the WW1 Centenary Reception invite to number 10. PC. Looking back to the early days of the NCFA it would have seemed incomprehensible that one day you would be knocking on the most famous door in the world. Do you think that reflects how far the NCFA have come over the years? EB. I never doubted the need for a Children’s Football Alliance, neither did the stakeholders, Brunel University, Leicester University and University of Gloucester. NCFA core members are the salt of the Earth when it comes to the aims of the organisation. I was indeed pleased that the Government invited the NCFA to talk about our work and support the WW1 commemorations at a community level, which I feel recognises the importance of every community that had no choice 100 years ago. I think it is a testament to how far the NCFA have travelled over the years – if the Government are listening, then one hopes the sport you wish to make better is listening too! PC. Did you get to speak to the pm and if so what about? EB. I did manage to speak to the PM about the Peace Fields Project and how NCFA are seeking to twin designated areas of school playing fields with Flanders Peace Field through the Peace Village, Messines, Belgium. We briefly discussed the importance of sports at community level engaging in the WW1 centenary commemorations. I stressed that memorials to peace inspired by the Christmas Truces were just as important to memorials of war. As you can imagine the PM’s time is a little like the BBC’s, every second is monitored, recorded and stop watched. PC. It appears that the NCFA are filling a void and that politicians recognise this. What is you take on this? EB. In my opinion it is almost ironic that politicians recognise the NCFA on level that chimes with their ‘Big Society’ and yet, sport, particularly football, can be considered by the general public a law onto themselves. Football is now a constant battle of the brands – it is tiresome – many people see through the marketing agendas; I think the Piece Fields Project will remind people that there is a lot more to football than brands and win at all costs, the Project lends itself to the essence of play. Children that took part in the Football & Peace Projects re-evaluated how they felt about the modern day football machine. They considered a space, time and place, where the Christmas Truces in 1914 were humanitarian acts provided moments of hope in a world of chaos. Allies and Germans played games just like they did in their childhood to escape reality. With that thought in mind maybe some politicians are human after all? PC. What other organisations were at the function? EB. The great and the good from community projects. There was a wide variety of organisations many from the education sector. The most impressive person I met was Neil Beddow artistic director from Acta Community Theatre who have recently been performing ‘Gas Girls’ which has been receiving critical acclaim in the West Country for their performances. The reception was peppered with celebs which I guess is a necessary tick in a box. PC. How will attending such a function help the NCFA? EB. It will raise the NCFA profile which will lead to bolstering a growing network in the third sector (charities) for children’s football. Hits on the NCFA website continue to rise with more child focused organisations recognising the value of partnership work. Attending functions hosted by high profile people is an expected part of the course for further legitimisation. I don’t mean to sound cynical here but I find the whole process a learning curve and frustratingly slow. PC. Two finish off can you describe what it was like to put on a suit and tie. Also please tell me they had cocktail sausages and cheese footballs in the buffet at Number 10! EB. On a lighter note; my old man once said to me that, ‘you have to earn the right not to wear a suit’. So, I expect I will be wearing a suit like a straight jacket for the rest of my life. Regards the cocktail sausages and cheese footballs, unfortunately, they missed a trick because there were lots of school children on the premises. If fact, number 10 Downing Street has got the perfect garden for jumpers for goal posts. It did cross my mind to challenge the government to a quick game of footy but I feared the neighbours might have kicked up a fuss!